This post is sponsored by Wilsons Leather. All opinions and love for the jacket are my own. I remember the strangest things from my childhood. The smallest, probably most insignificant things to most people stick out in my head so vividly. I can remember my parents coming home from parent teacher conferences (or really anytime they went out and I had a babysitter) and them giving me a hug while still wearing their leather jackets. I don’t know why I remember this but I remember them being cold and the cold air following them inside, with a mix of leather and their perfume and cologne radiating through the air. It’s just one of those things from my childhood that sticks out, and the smell of leather will always remind me of my parents. 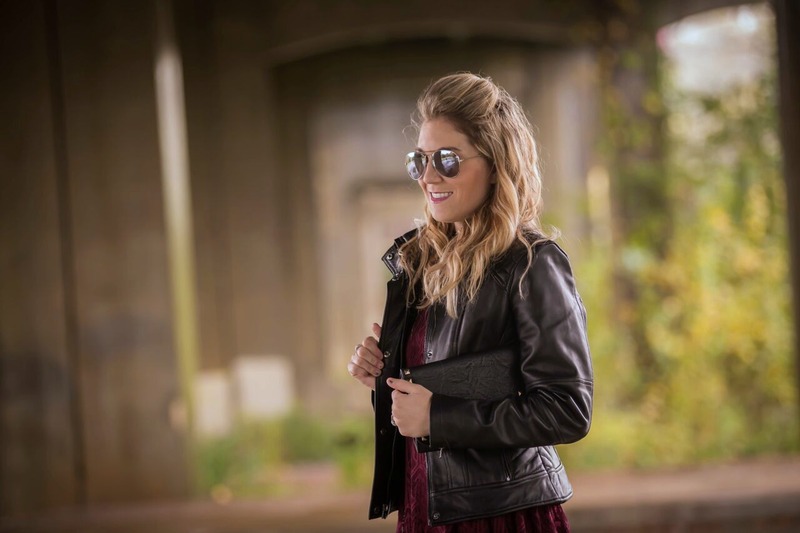 Leather jackets are timeless. They’ve been around forever and I don’t think they’ll ever go out of style or not be “trendy”. 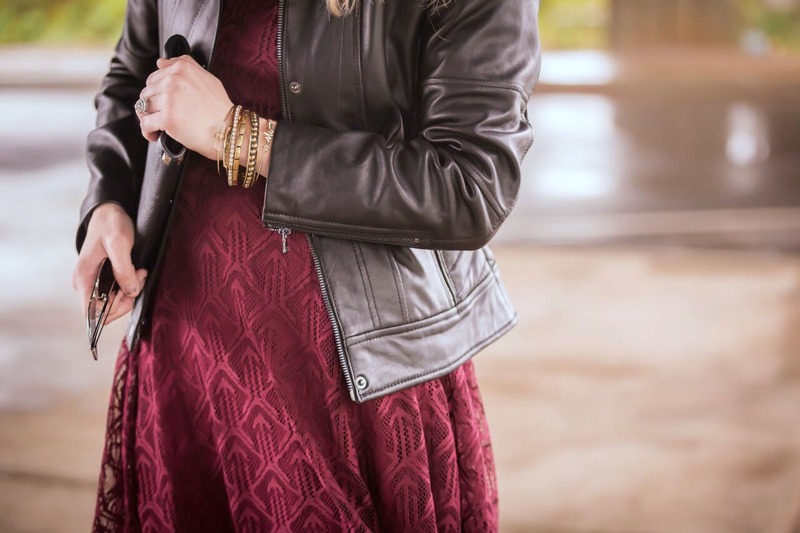 Sure, the styles of the jackets change in popularity, but the idea of a classic leather jacket completing an outfit will never change. 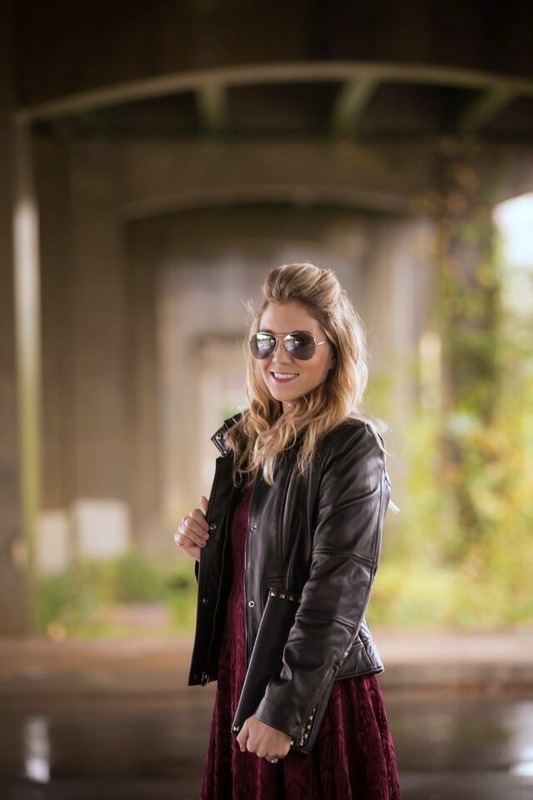 With the temps finally starting to cool down here, I couldn’t wait to try out my new Wilsons Leather jacket. I used to think of jackets as a piece of outerwear, which they are, but they can also be a part of your outfit. 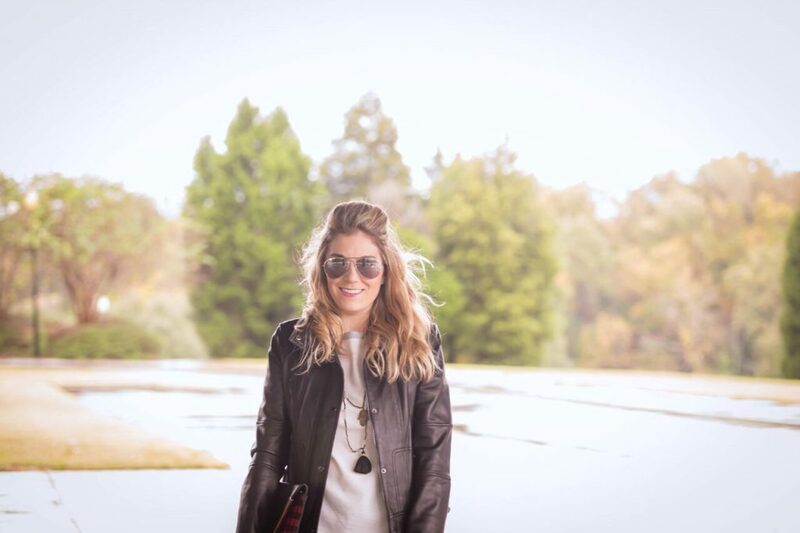 So how do you style a leather jacket? I styled the jacket two different ways. This particular jacket has a slim fit, so I wanted to pair it with a lace dress to mix different textures. I loved the femininity of the dress with the jacket, which gave it an edgier feel. I paired it with these black booties (which you’ve seen a ton because I’ve been living in them this fall!) and a gold studded clutch. 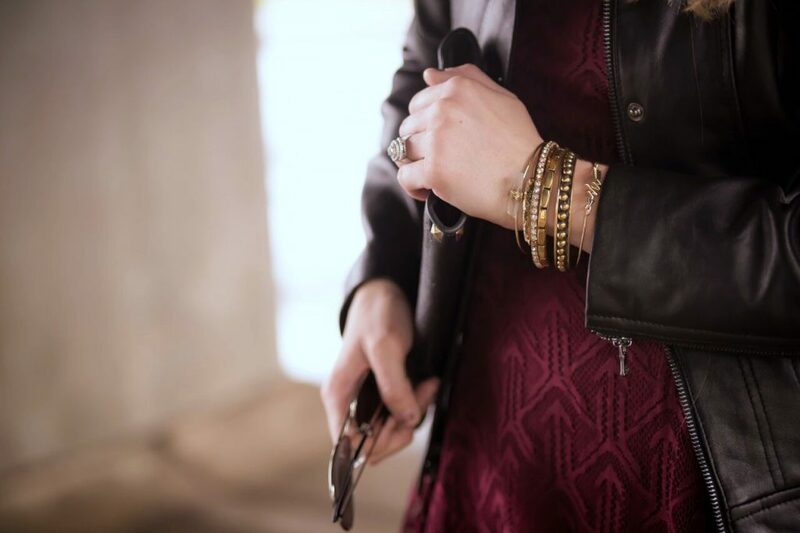 I kept my jewelry minimal and decided on a gold stack of bracelets. 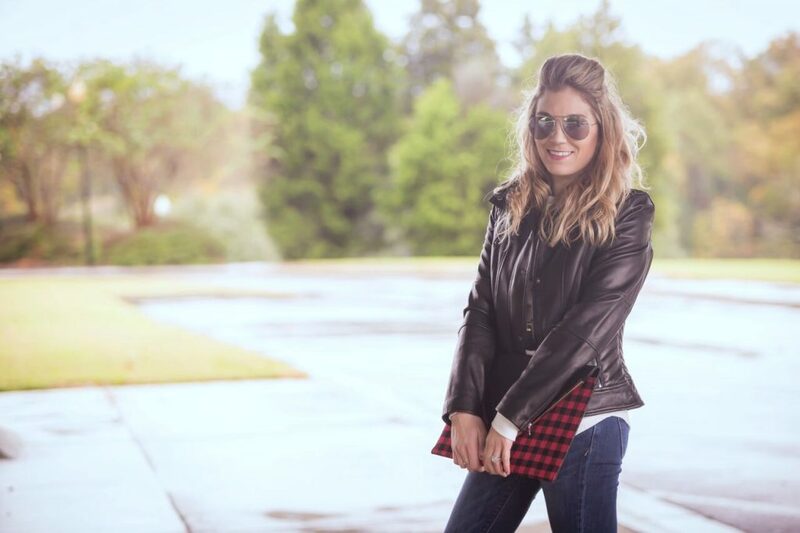 This jacket would look good with any dress and a pair of booties, so get creative and try different combinations! For the second look, I went with a more casual outfit and wore jeans and a thermal top. 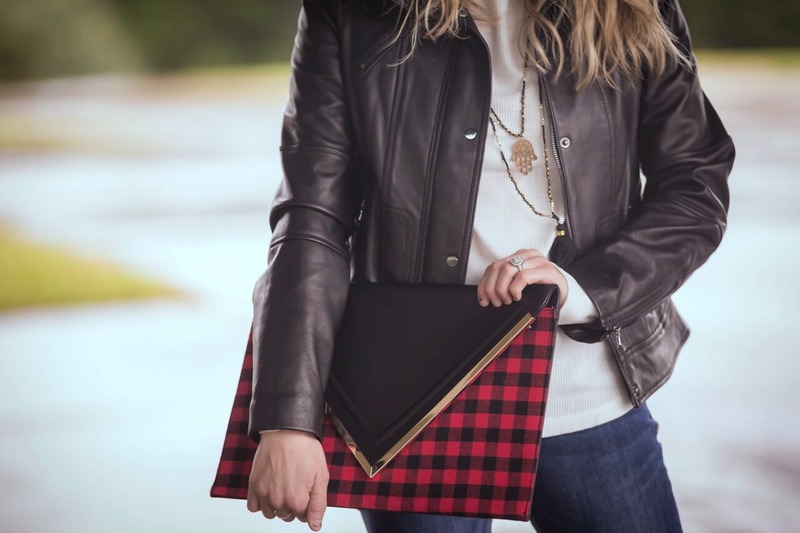 Again, I kept it simple with a necklace as my only jewelry, but that’s because this clutch is a big statement piece in itself! 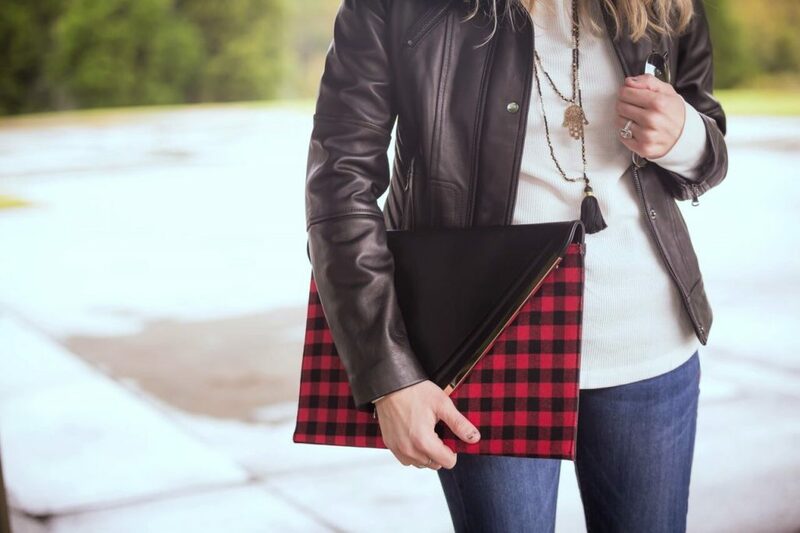 We all know buffalo plaid is huge in the fall and since I’ve only have worn the pattern in shirts, I thought this clutch was fun to switch it up. 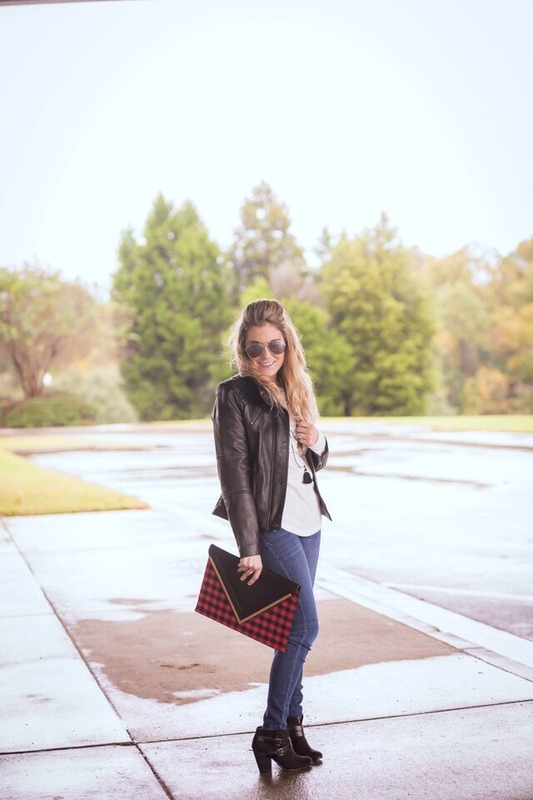 The jacket just brings the outfit together and gives off a chic, fun, and trendy vibe. 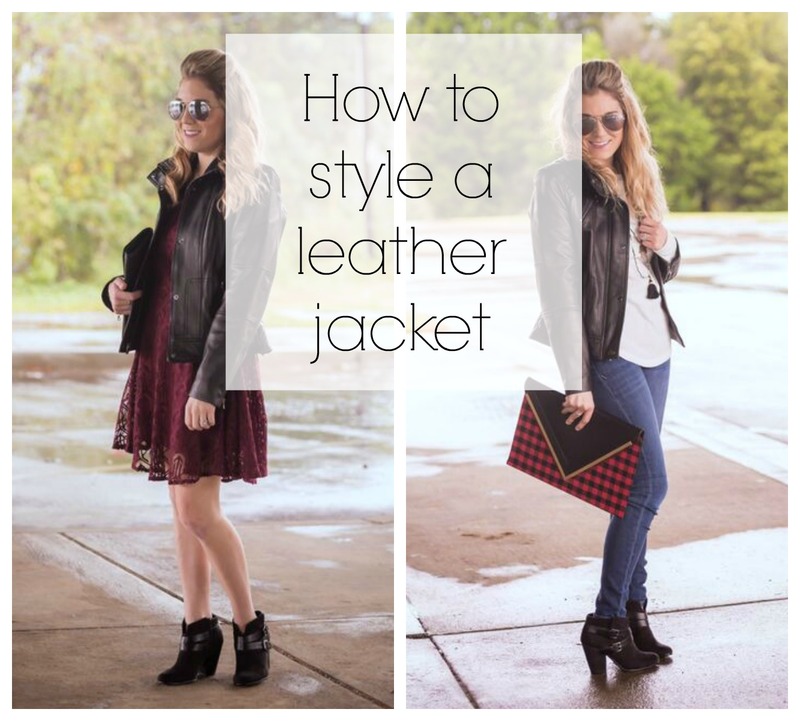 Leather jackets can go with almost anything and experimenting is the best way to find out what works best for you. Throw it over a summer maxi to transition for fall. 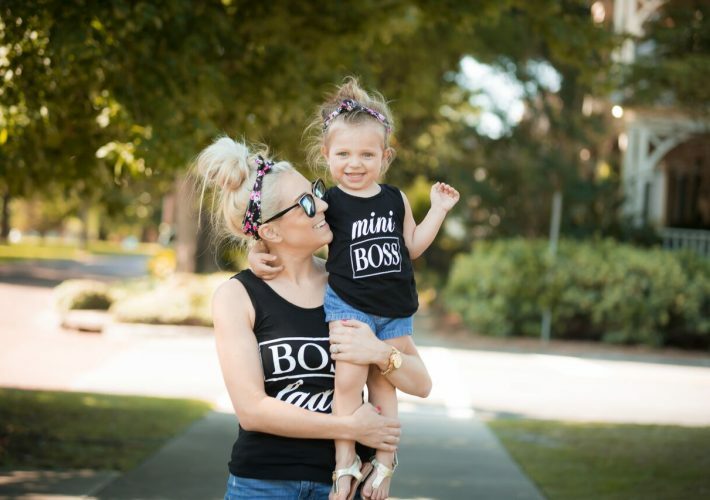 Wear it with a midi skirt and heels. Add a scarf for a more cozy, comfortable look. Layer over a cute hooded sweatshirt or turtleneck sweater. Dress, tights, combat boots… BOOM. And there you have it! 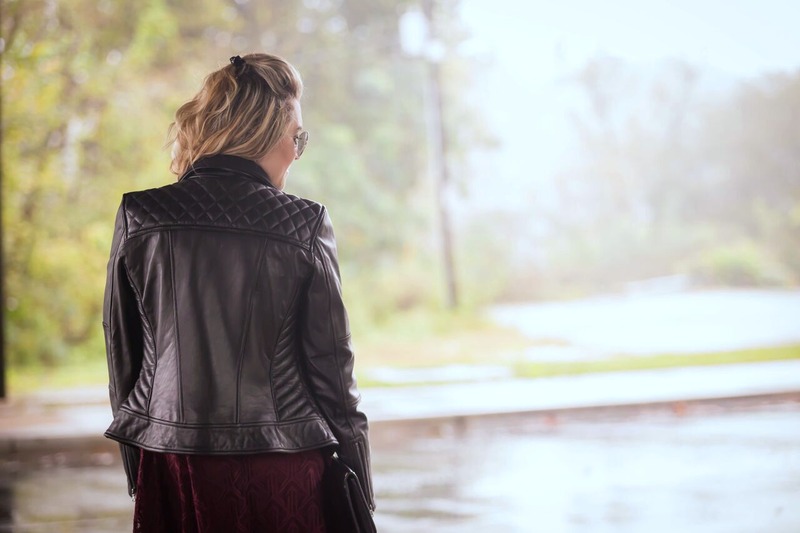 You can pretty much “fall-ify” anything by adding a leather jacket. Definitely a must-have piece for the colder months 🙂 And if you’re in the market for a new one, be sure to check out Wilsons Leather… they’re running some great sales right now! Happy shopping! Tell me, how do you wear a leather jacket? Give me some more inspiration! « A spooktacular Halloween weekend.